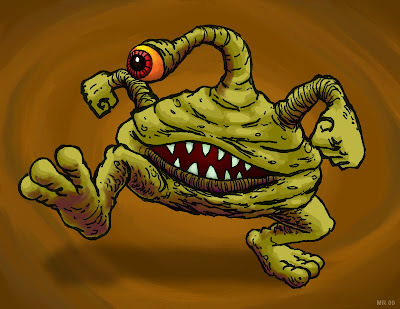 A Gloppytrus is a short, squat, dollop-shaped alien that resembles a pile of mud. They spend their lives deep within sprawling mud holes, some of which are miles across. Each mud hole is connected via an underground water system. The Gloppytrus have eschewed advanced technology for a simple, stress-free, tribal lifestyle, although there are some who have ventured out into the universe to seek fame and fortune.